An energy crisis has plunged a remote group of islands in the Pacific ocean into darkness, as inhabitants reap the harsh legacy of exploitation by the United States. Soaring fuel prices forced Marshall Islands’ president, Litokwa Tomeing, to declare an emergency on July 3 because the national power utilities face an estimated $17.5m-$21m shortfall over the next 12 months, assuming present trends continue – almost 20% of the national budget. 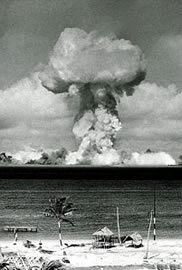 It was in the Marshall Islands, of which Bikini Atoll is a part, that the US detonated 67 nuclear bombs between 1946 and 1958 including one named Castle Bravo, a huge hydrogen bomb. 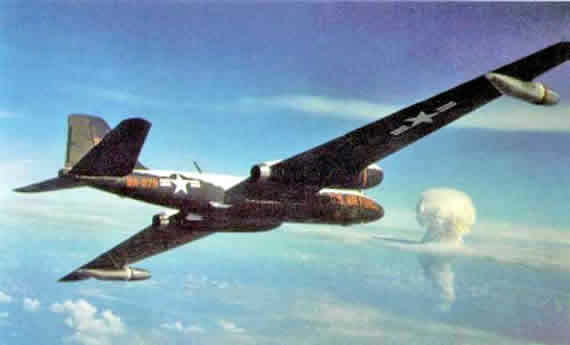 The combined radioactive energy yield of these bombs was roughly equivalent to 1.7 Hiroshima explosions every single day for those 12 years. The 200 inhabitants of Bikini Island, forced to move to a nearby island before the tests, still cannot return. The top 16 inches of the soil were scraped off, creating a hazardous radioactive pile of a million cubic feet which cannot be disposed of, but the island remains contaminated and unsafe even today. Soon after the Bravo shot, many islanders became guinea pigs in a secret medical experiment called Project 4.1, set up by the US to study the effects of radiation on human beings. With a legacy like this, it is perhaps surprising that anyone has survived in these islands at all, especially as the Ronald Reagan Ballistic Missile Defence Test Site is also located there and as the US army conducts an aggressive recruiting policy for the youth of the islands to fight the "War on Terror". Poverty and unemployment have taken hold as the old culture based on fishing and agriculture has given way to the world of the military, the corporates and the developers. Julian Aguon, a law student, a writer and a campaigner for indigenous rights and self-determination, made an epic journey to research What we Bury at Night: Disposable Humanity, his third book. Travelling throughout Micronesia, from the Marshall Islands to Pohnpei, Chuuk, Palau, Saipan, and Guam, he discovered how islanders have survived since the US war machine arrived, and what they think about the loss of their culture and about the “starving of their imaginations”. His book takes the form of a commentary as the author journeys round the islands, interspersed with the stories and the opinions of the islanders themselves. They are full of indignation, distress and also regret that their leaders were sucked, even tricked, into various compacts and agreements with the US. In 1944, the US seized the islands from the Japanese, who had ruled under a League of Nations mandate. After the war, US tutelage continued, with the islands only achieving full independence in 1990. “Grape babies… they occur in like one in two million cases and we’ve had 20 of them in Likiep (one of the smaller islands). Some women have repeatedly given birth to these... So what do they do? They go bury them. In the middle of the night…. They don’t want the rest of the world to know. And now the Americans come and say: “If this was such a great problem, how come these people don’t talk about it”. Well it was US policy to keep this information down and anybody who spoke out was a communist…”. Aguon denounces the US military in particular for the way their recruitment drives have divided the islanders and how these “volunteers” have been used in the “War on Terror”. Poverty and lack of opportunity in the new economy, as well as the break up of their traditional culture, has led the youth to sign up, get a training and earn some money. Many of them never return. He says that the people of FSM (Federation of the states of Micronesia, which includes the archipelagos of the Marshalls, the Carolines and the Marianas, all in the western Pacific) are now “so economically dependent, so imprisoned by imports, so desperate that they cannot even imagine another arrangement. This is their cancer”. The islanders are famed for their stories and their story-telling and this is evident in the book, as the islanders and Aguon himself speak of themselves, their lives, their dreams and regrets in an imaginative, defiant and almost poetic way. But as Aguon says: “It's hard to smash ancient civilisations to make them fit into cans of Spam, Corned Beef and Western Economic Theories of Development”. As the US government continues its military build-up in the area, especially in Guam, and as the real nature of the Micronesia-US relationship is exposed, so the defiance and the movement for true independence is bound to grow.